This ruler has four sliding sides connected and secured with knobs that can be loosened and tightened to slide the sides into any shape that you require. This enables you to make exact cuts every time and avoid error. You will produce professional and polished work and avoid imperfections, errors and needless re-work. You will get the value of this simple but intelligently designed ruler many times over when you discover all the different materials and projects you can use it for. Capture the needed shape of floor tiles, ceramics, wood, metals, plastics and just about any solid or semi-solid material with this clever little ruler. It's ideal for all tiling and roofing jobs and will save you money by avoiding error and re-work. It will also save you plenty of time as you won't need to keep measuring shapes. Projects will be fun instead of tedious. The multi angle ruler slides into an easily portable shape when the two long sides align together. Its sturdy plastic makes the template tool durable yet lightweight. Its knobs have metal screws on the inside to enable easy screwing-unscrewing and securing. Use this smart tool for tiling, carpentry, roofing, and many other building and DIY projects. Use with any material including marble, wood, ceramic, stone, brick, carton, paper, and many more. You only this tool to capture the shape for all these materials. 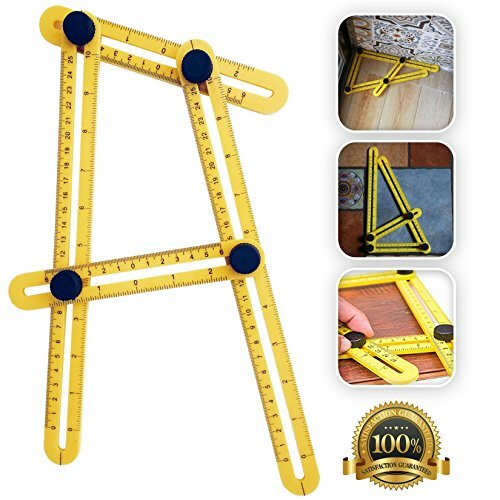 DURABLE & STURDY: The Saberline multi angle measuring ruler is made of lightweight but sturdy plastic to make it easy to use and carry around without damage. Its metal knobs are easy to screw and unscrew without wearing because they are made of metal on the inside and further protected by the plastic knob. The Saberline template tool stores easily. Just line up all the sides along each other and slide back into its box. EASY TO USE: Unscrew metal knobs and place on top of your work area. Slide the sides of the angle tool to match the required shape. Tighten metal knobs to keep the shape of the angle ruler in place and reuse as many time as needed to duplicate the shape you're working on. VERSATILE APPLICATION: The template tool is ideal for a wide number of profession and DIY projects and can be used for a broad range of materials including wood, tiles, ceramics, brick, flooring material, metals, roof angles, door angles, glass and more. TOOLBOX ESSENTIAL: The Saberline multi angle ruler is ideal for builders, carpenters, craftsmen, and DIY enthusiasts because it's so versatile. Use it to re-tile bathrooms, build archways, make plumb cuts, cut patio brick and much more. SIZE AND CONTENTS: The Saberline multi angle template tool is rectangular when opened to the maximum, its two long sides are 10 inches each, and its two short sides are 5 inches each. It comes in a plastic covering inside a hard carton box. If you have any questions about this product by Saberline, contact us by completing and submitting the form below. If you are looking for a specif part number, please include it with your message.